Success! Day five was noteworthy for our first glimpse of the redan! This exciting discovery prompted camera crews from Channel 5 and Channel 4 to come to the site today—be sure to watch the evening news tonight! The big news came this morning when archaeologists digging in a unit directly adjacent to South Adger’s Wharf came across a portion of angled brick wall. We’ve identified this as the outer wall of the redan’s south face. 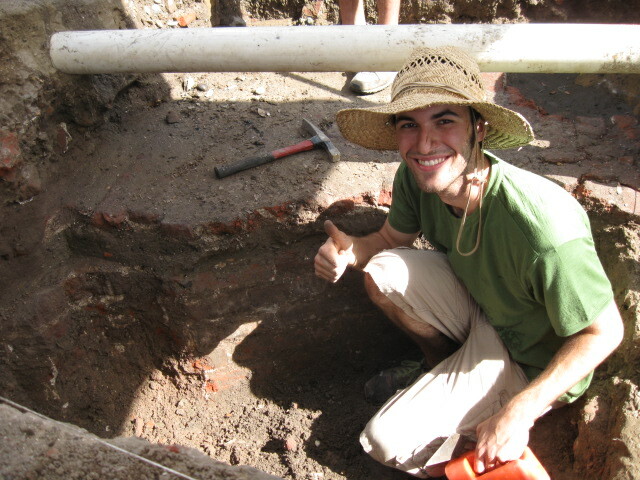 The redan was found directly underneath the brick market pavers that were put in place 1784 and 1786. 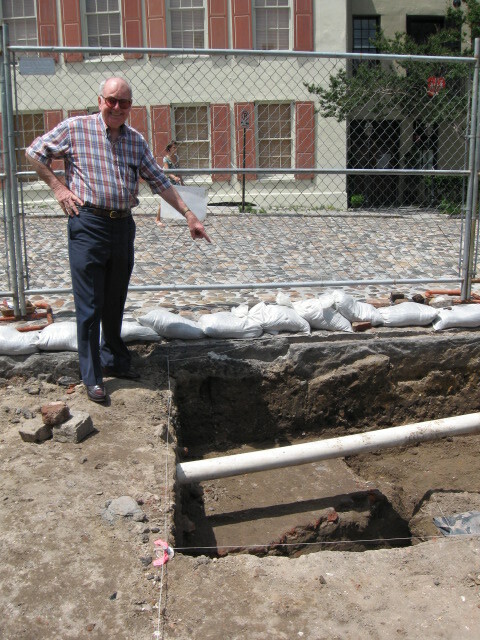 In 1784, the South Carolina Gazette reported on several recommendations for the city including a recommendation “that the market called the Lower Market, be immediately paved, as in its present situation, it is extremely offensive and disagreeable to the inhabitants, and others who resort there.” After mapping and photographing the pavers yesterday and today, the archaeologists have carefully removed many of them. This will continue on Monday as we continue to trace more of the redan’s south face. The location of the south redan face in the area of the parking lot closest to S. Adger’s Wharf is good news. 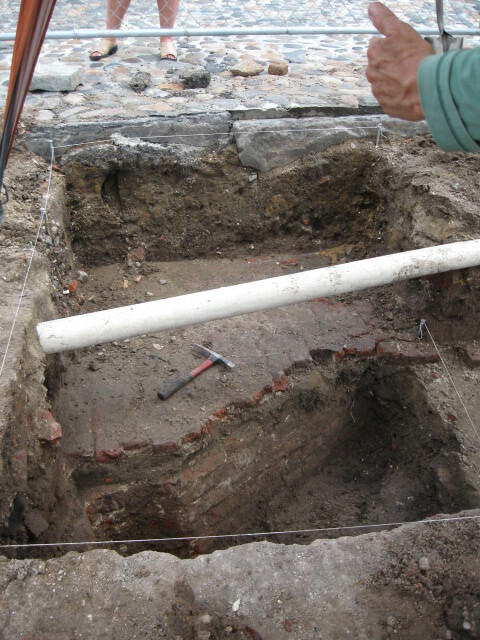 It seems possible that the builders of Vanderhorst’s north tenement may have built that structure adjacent to the brick remains of the redan, rather than directly on top of it. It’s also good news because we may be better able to interpret this feature to the public in the future without disrupting much of the city’s parking lot. Depending on where the rest of the redan wall is located and how much remains, we may be able to explore the possibility of “glassing-over” the brickwork, or, at least, somehow marking the outline of the redan. 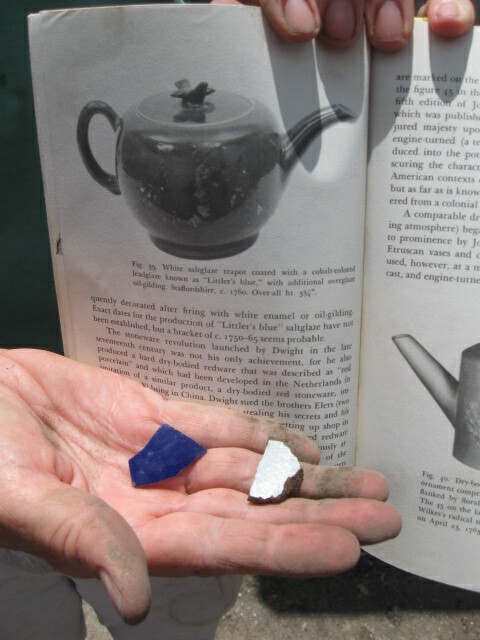 Monday’s digging should reveal more of the redan—be sure to stop by the site if you can and stay tuned! Here in Pittsburgh the outline of the old baseball field (Forbes Field) is set in bricks in the sidewalk. Mentioned here in a walking tour of Oakland. The outline indeed serves a useful way of understanding where the old structure was and is an interesting feature.